Now, it may seem kind of absurd, my putting up a posting on the quarrying industry at Liberal, but this was part of what Liberal was about, People such as George Walser made a living off mining stone. So, here you go. Plate XLII. Asphaltic Sandstone. 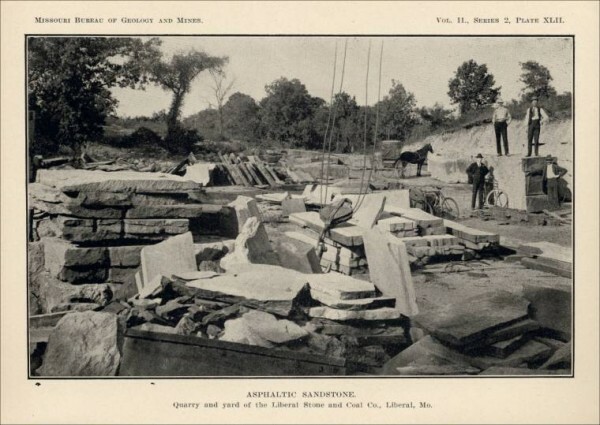 Quarry and yard of the Liberal Stone and Coal Co., Liberal, Mo. Plate XLII. Asphaltic Sandstone. The Lower Coal Measure sandstone, which outcrops in the vicinity of Liberal, is quarried both north and south of the city. The beds are thick and massive and break into very regular blocks. Stone can be obtained of any desired dimensions. Three quarries are operated at this place, two of which are owned by “The Liberal Stone and Coal Co.” and the third by W. H. Curless. The stone is essentially the same at the three quarries, excepting at the north quarry of the Liberal Stone and Coal Co., where it has been impregnated with bitumen or asphalt. The stone has been used mainly for buildings (local), bridge abutments, sidewalks and curbing. THE LIBERAL, STONE AND COAL, CO’S. QUARRIES. 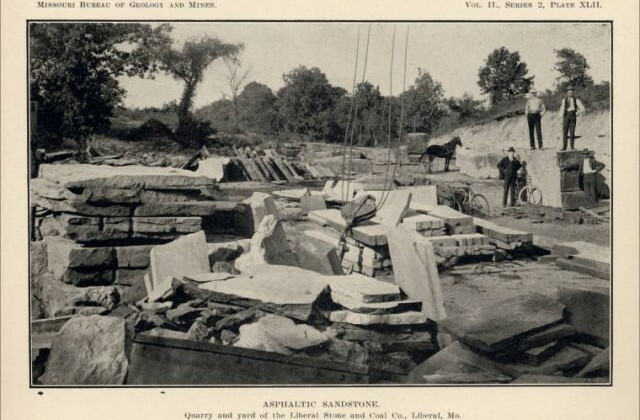 The asphaltic sandstone quarry, which is located two miles north of Liberal, in the N. W. % of the S. W. yA of sec. 23, T. 33, R. 33 W., is owned by Mr. Geo. H. Walser and operated by Geo. H. Walser and C. H. Carter, Jr., under the firm name of “The Liberal Stone and Coal Co.” This quarry is situated on the west side of a hill, west of the Missouri Pacific railroad, and has a west face about 300 feet long. It has been worked into the hill about 150 feet. The stripping, which is thickest in the middle of the quarry, consists of from one to ten feet of shale and clay. In the stripping, about four feet from the bottom, occurs a six-inch bed of very hard, black, fossilifer ous, fine grained limsetone. Underneath this bed, the stripping is a yellowish clay, while above it is a carbonaceous shale and red clay. The sandstone is very fine grained and micaceous, and has a blackcolor, due to the asphalt content. It is somewhat harder than the stone in the other quarries of this place. It has faint stratification planes parallel to the bedding. These are short and discontinuous, never persisting throughout the length of the bed. They are very common in all parts of the stone. The face of the quarry consists of one channel cut from three to four feet in depth. The beds dip slightly to the north and the channel cut increases in depth in that direction. The exact thickness of the workable stone is not known. That in the floor of the quarry is similar to that in the face. The joints, which strike N. 20° K, are very prominent, and are from ten to fifteen feet apart. They are stained with iron oxide. Apparently there are no joints at right angles to this set. The stone is sawed parallel to the bedding and cut into pieces suitable for crosswalks, sidewalks and curbing. The large amount of asphalt in this stone makes the absorption very low in comparison with that from the other quarries. On the sawed surface weathering sometimes loosens small pieces, which fall away leaving shallow depressions in the stone. The company is obliged to haul the stone by team from the quarry to a nearby spur of the Missouri Pacific railroad. Derricks are used to load the cars. Steam derricks, steam drills, channelers and gang-saws are used in getting out the stone. When in operation the quarry employs an average of ten men for nine months during the year. Owing to litigation, it is now idle. This company owns another quarry one-half mile south of the city, in the W. y2 of the N. E. %. of sec. 11, T. 32, R. 33 W. The opening which is being worked consists of a cut 40 feet wide, 10 feet deep and extending into the hill about 200 feet. eight inches wide. Owing to their position these streaks injure the otherwise uniform color of the stone. The joints are from twenty to thirty feet apart, except in the western portion of the quarry, where they are considerably closer. They have a dip of from 9° to 11° W., from the vertical, and strike N. 36-42° W.
The quarry is connected by spur with the Missouri Pacific railroad. It is equipped with machinery, including a derrick, for loading the stone. Crushing strength 4,370.6 lbs. per sq. In. Tensile Strength 202.6 lbs. per sq. In. Transverse Strength 418.61 lbs. per sq. In. Ratio of absorption 10.19 per cent. Weight per cubic foot 132.3 lbs. Crushing strength of samples subjected to the freezing test 3,188.7 pounds. Crushing strength 9,002 lbs.per sq. in. Tensile strength 344.5 lbs. per sq. In. Tranverse strength 769.93 lbs. per sq. In. Weight per cubic foot 142 lbs. Crushing strength of samples subjected to freezinz test, 9.230 pounds. An examination of these results indicates the superior quality of the asphaltic over the ordinary yellow sandstone. The asphaltic sandstone has a higher strength, crushing, tensile and transverse; the porosity is about one-third that of the yellow sandstone; and for the samples tested the asphaltic sandstone lost nothing in strength through freezing and thawing, while the yellow sandstone lost about 33J per cent. This quarry, which is located about a mile west of Liberal, in the N. W. %, S. E. J4, sec- 2, T. 32, R. 33 W., is owned and operated by W. H. Curless of Liberal, Missouri. It consists of three openings situated near one another on the west side of a hill. The middle opening is the only one which is worked at present, although considerable stone has been quarried from the other two. The opening which is farthest north has been worked into the hill 150 feet and now has a face six feet deep and 200 feet long. The south opening has a twelve-foot vertical face, consisting of several thick beds from which might be obtained stone of large dimensions. The stone contains an occasional cavity filled with iron oxide and near the bottom it is streaked brown with iron oxide. The middle opening which is being worked contains the best stone in the quarry. The working face is about 250 feet long and consists of a single massive bed of sandstone eight feet in thickness. Above this bed occur a four-inch layer of shale, a six-inch bed of sandstone, eighteen inches of sandy shale, a twenty-inch bed of sandstone and four feet of alternating shale and sandstone in layers about four inches in thickness. The stone is a fine grained, micaceous sandstone, varying in color from a gray to a buff, the latter color being due to small specks of disseminated iron oxide. Xear the top of the quarry occurs a twelve-inch bed of reddish colored stone containing a higher percentage of iron oxide. The major joints in this quarry, which are open from one to three inches, contain a heavy red plastic clay. These joints strike N. 55° WN. 30° E. and east and west. The strike of a number of these is not constant in direction, varying from 15° to 30°. The Knox svstem of blasting is used. The stone breaks with a verv smooth fracture, splitting with plugs and feathers into blocks of almost any desired thickness. For dimensional stone $3.00 per yard. Ashlery, from 12-16 In. sq 2.50 per yard. Microscopic.—An examination of the thin section of this stone under the microscope shows that it consists chiefly of roundish to sub-angular grains of quartz. The interstices contain calcite, kaolin, iron oxide and chlorite. The quartz individuals arc small but quite uniform in size. The grains are not very firmly bonded together. Crushing strength 4942 lbs. per sq. In. Tensile strength 306.5 lbs. per sq. In. Transverse strength 708.9 lbs. per sq. In. Weight per cubic foot 129.3 lbs. Crushing strength of specimens subjected to the freezing test, 5,742.7 lbe. per sq. In.